Bohrium is a synthetic element that is exceedingly difficult to study due to its extremely short half-life. Although it was officially discovered at the Institute for Heavy Ion Research (Gesellschaft für Schwerionenforschung) in Germany in 1981 by bombarding bismuth-209 with chromium-54, it was not until 2000 that an international team was able to produce large enough quantities of the element to examine its chemical properties. The heaviest isotopes decay the most slowly, with the longest measured barely passing the 60 second mark. The low stability of this element precludes its use outside of basic science research. Bohrium was named in honor of Danish physicist Niels Bohr, whose innovative work on the structure of the atom is fundamental to atomic physics. Bohrium is a D-Block, Group 7, Period 7 element. The number of electrons in each of bohrium's shells is 2, 8, 18, 32, 32, 13, 2 and its electron configuration is [Rn] 5f14 6d5 7s2. In its elemental form, bohrium's CAS number is 54037-14-8. Bohrium is a synthetic element and therefore is not naturally found in the environment. Little is known about the element, its appearance is unknown, and it has no known uses. Production of bohrium was first announced in 1976 by scientists from the former Soviet Union and was verified in 1981 by Peter Armbruster in Germany. Bohrium is named for the Danish atomic physicist Niels Bohr. Bohrium information, technical data, properties, research, applications and other useful facts are detailed below. Scientific facts, such as the atomic structure and ionization energy, are included. 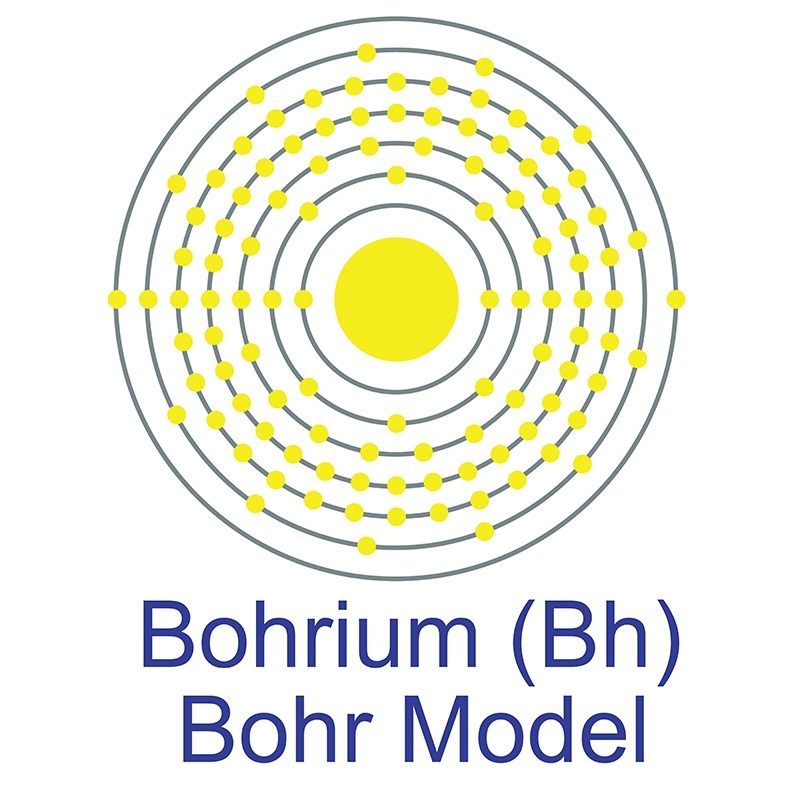 Bohrium (Bh) is an artificial element. Like all artificial elements, it has no stable isotopes.